A lot of what we do in the primary grades is repetitive. This is often why those who have never taught primary think it is just so easy. Those little minds need a TON of repetition because they have a TON of skills to master. That mastery is THE link between the beginnings of being a student and success in future school years. During this delicate age kiddos are not only introduced to written language but also expected to master phonemes, phonetic patterns, basic grammar and sentence types. That’s a whole lot of expectation for 5-7 year old minds. It’s nearly impossible to teach primary students skills in isolation. We have to rotate skills in and out (over, under, in between and sideways, too!) to make sure they not only GET IT… but won’t FORGET IT! The skills require higher orders of thinking. The practice necessary is vast. Our Kinder friends introduce the kiddos to basic, simple declarative (telling) sentences. We know they’ve done their end because our kiddos come to first grade able to write those simple sentences clearly, with correct spacing, upper case first letters and periods. When they come to us we expand their knowledge with the introduction of excited and asking sentences. With common core the lesson expectation goes a step further. It’s important for all grade levels to use academic language with the kiddos as soon as possible. I do think that introducing telling, excited and asking sentences early on is a good idea. These terms help make the concepts relatable to the munchkins. But, once they’ve mastered what those different types of sentences sound and look like, it’s more than appropriate to use the correct academic language that they will be expected to know from that point forward. Spiraling sentence practice into to simple and compound declarative, interrogative, imperative and exclamatory sentence practice is easy if you work on it often and make sure those terms become part of your everyday classroom language. In an effort to make sure that this part of our language expectation is part of my kiddos everyday material, I created a resource with which they can interact. I begin by introducing a series of posters and relating these posters to what they already know. The poster above is a combined look at the sentence types. This gives the kiddos an overall view. These are the sentence type anchor charts I use to introduce the concept of identifying and writing various sentence types. Each type has it’s own poster so I can easily focus on one type at a time. I put them on my white board and move them into “focus” in the main part of the board as we use them. I LOVE using adhesive magnets to put up all of my anchor charts and posters. In an effort to make sure we learn in a “real world” way, I try not to do too much in complete isolation. When we are working on sentence types, we revisit phonics, fluency and comprehension too. Little readers are one of my favorite ways to incorporate a whole lot of skills into an activity that also places importance on developing a new skill. The lessons that introduce new concepts should be recognizable – comfortable. At the same time, they need to provide challenge and develop new learning. It’s often best to use small activities that allow me to demo the expectations, allow them to work with a group or a partner, and also give them an opportunity to try the skill on their own. Once your kiddos get comfortable identifying concepts, they need to USE what they’ve learned. I try to provide as many opportunities as possible. When they can demo their understanding THIS clearly – nothing makes your heart sing more!! After introducing and working with new concepts for a bit, it is not time to put that skill practice to rest. It’s a good idea to have games and activities that allow your kiddos to practice those those skills during word work for many weeks to follow. 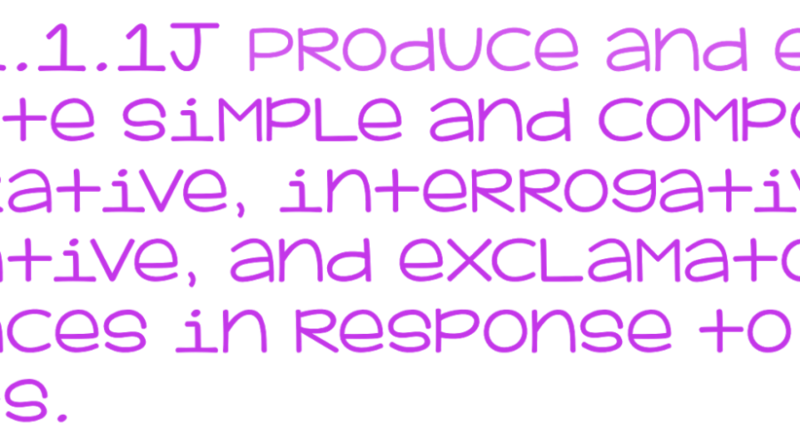 In addition to that independent practice, use the terms, expect the various sentence types. Locate them while reading stories and informational text. Write with them during writing lessons – whether it’s an opinion, narrative or expository piece. The way to mastery is to be sure it becomes engrained in their schema. Although this resource focuses on one common core standard, it incorporates a variety of skills essential to primary learning. You can grab Spectacular Sentences in my TpT Store. My first thought was this looks fantastic. My second thought was that it was a lot of work for you to put it together. Looks like you did a great job!